I was never very good at Chemistry. I cherry picked my way around it for the Junior Cert and didn’t take it for the Leaving Cert or as part of my science degree. I never really got beyond the three types of bond and the fact that electrons are in shells and that the amount of them on the outer shell is very important. I don’t think I ever considered Chemistry fun. However, I was really impressed by the work of the Chemistry department in the University of Nottingham when I stumbled across it last month. They have created a YouTube video about every single element in the periodic table! I’ve watched them all over the space of a few weeks (a few a day) and I learned a lot as well as being entertained. You get to see real chemists talking about the elements, as well as doing experiments with some (often involving explosions), and you get to see samples of most of them. Although I always knew what Gold and Silver looked like, I had no idea what Bismuth looked like! What’s also cook is that these videos are still being updated and expanded so you can watch the project grow. You’ll find the periodic table of videos at www.periodicvideos.com. They also have a channel on YouTube where you can see all the videos and subscribe to their feed so you never miss an update! 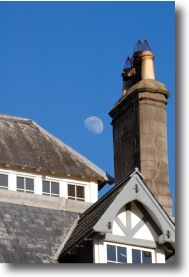 It can be very nice to include the Moon in your shots of buildings or landscapes but it’s not easy. The reality is that the Moon is very small in the sky and that it’s hard to pick up detail on the Moon while also properly exposing your subject. That’s why so many people cheat and get the Moon into their shots using PhotoShop. They stick on a massive zoom lens, shoot the Moon, then stick on a normal lens to shoot their subject and finally combine the two shots into one. If that’s the way you want to do things that’s your call, personally I look at it as cheating and would prefer to do it the hard way and actually capture the Moon and my subject in a single shot. The last time I posted on the state of play for free Astronomy software for the Mac things weren’t looking so good. At that time your best option was to build the Linux program KStars from source using Fink. A long, complicated, and rather daunting install for anyone who’s not a Unix geek. I’m happy to report that things have improved a lot since then. There’s now a choice of three apps and you don’t have to compile any from source (unless you want to). This week I’ve started on the next rung of the Astrophotography ladder. Until now I was just taking a few hand-held shots of planets in the evening twilight. While they were nice shots, there is a lot more to astrophotography than that! What I’ve started experimenting with this week is using my very bright F1.4 30mm prime focus lens for longer tripod-mounted exposures. I’m already in love with my prime focus lens but this is yet another reason it’s the best €300 I’ve ever spent. I get a lot more use out of it than I do out of my zoom lenses. This will be the first of three Astronomy themed posts over the next few days. It’s first because it takes the least effort on my part … the other two will have taken more time and effort. The government’s climate change policy works like this: extract every last drop of fossil fuel then pray to God that no one uses it. Contrary to popular belief Astronomers do in fact have a sense of humour! I have below incontrovertible evidence! Oh … and they can also sing pretty bloody well! 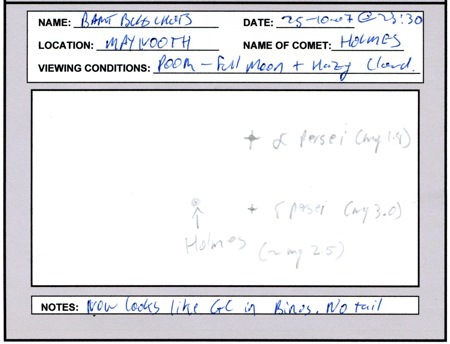 With the Irish weather being what it is it’s been quite a while since I’ve managed to get a good look at the periodic comet Holmes. Since my last post about the comet I managed to observe it just twice, once on the 28th of October, and this evening. I didn’t bother posting on the 28th because conditions were poor and not much had changed since my last post. 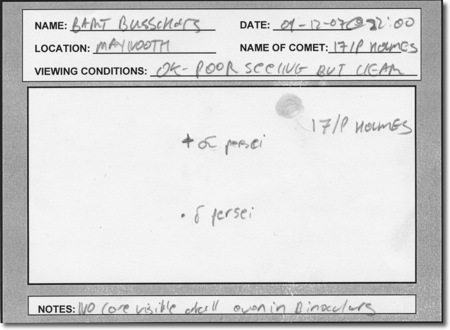 However, today, I got to observe the comet with good observing conditions. After yesterday’s surprise outburst comet 17/P Holmes continues to put on a great show. This object is highly dynamic and you can watch it move day-to-day with just the naked eye. Between yesterday and today the comet has moved noticeably closer to the star Alpha Persei and has also definitely brightened. Yesterday Holmes and the star Delta Persei looked to be the same brightness, today the comet is definitely brighter than the star. I’d estimate it’s brightness at about Magnitude 2.5. I’ve been following the comet with my trusty 10x50mm binoculars and the changes are even more spectacular through them. Yesterday Holmes looked like a star, a point of light with no noticeable coma or tail. Today, it looks like a compact globular cluster with a bright core. Yesterday I didn’t really notice a colour buy today it’s clearly yellow. I’ve never seen an astronomical object change so much so quickly. I hope we get to watch this fascinating object evolve for a few more days to come, however, the weather forecast for us here in Ireland is not looking good :(.